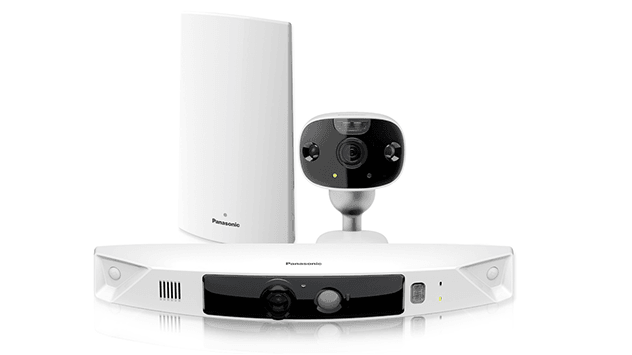 Panasonic’s HomeHawk, model KX-HN7002W, comes with two outdoor cameras to monitor your home. 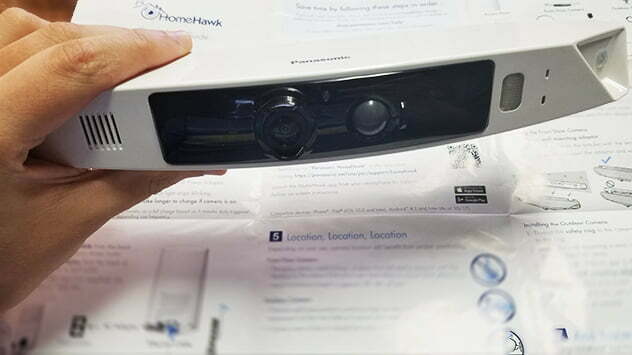 It’s amazing how one little box can bring such peace of mind, but that’s the case for Panasonic’s HomeHawk Smart Home Monitoring HD Camera System (model KX-HN7002W). The system includes two high-definition cameras — one for above the front door and one for another outdoor location — that watch over your home and can deter criminal activity. Monitoring your home has never been more simple, effective or secure. Let’s explore what’s in the box and see how easy it is to set everything up! Panasonic HomeHawk’s front-door camera can capture 172-degree-wide activity below your entry. First, we have the front-door camera. It goes right above your front door and has a 172-degree diagonal, wide-angle view. It’s weather-resistant, has color night vision and it’s completely wireless! The device comes with a wall mounting adaptor, so just screw it in and you’re set. Next is the peripheral camera. It’s also weather-resistant and has full-color night vision. Mount it on your back porch or somewhere else outside where you want 24-7 surveillance, and you’re set. HomeHawk’s access point, which you can think of as the system’s brain, connects to the cameras wirelessly and stores around nine hours of footage per 4-gigabyte micro SD card. That means no storage on a cloud, and no monthly fees for file storage. Home monitoring systems are more popular than ever, and that’s because they’re more affordable than ever. Everyone wants to feel safe and secure in their home, and that’s no longer a luxury. Hidden costs like installation, file storage and professional monitoring deter some people from purchasing home camera systems. But HomeHawk carries no monthly fees — which is great for your household budget. And having local file storage, right there on the access point, means there’s no cloud (or its monthly fees) to deal with. Just screw the wall-mounting adaptor into siding above your door (purchase different screws if installing on concrete, mortar or tile), snap the camera onto the adaptor’s bracket and that’s it. The peripheral camera can be angled just the way you want it thanks to a strong magnetic wall-mounting adaptor. Each camera runs on Panasonic’s life-long rechargeable batteries. Once up and running, these systems help ensure you know who’s on your property, at the door, and if they’re welcome guests. They’re also useful for home shoppers who love free shipping — a convenience that brings lots of unattended packages on doorsteps. And you can monitor your home’s cameras day or night, near or far. So go ahead and take that vacation you’ve been planning without worrying about package deliveries or unwanted guests. You can keep an eye on things by using the HomeHawk app. A common problem with home monitoring systems is the black and white picture at night. It’s difficult to see who’s actually at the door based on the lackluster picture, and you don’t want suspicious people to hide under the cloak of night. The HomeHawk’s full-color night-vision camera eliminates that issue. 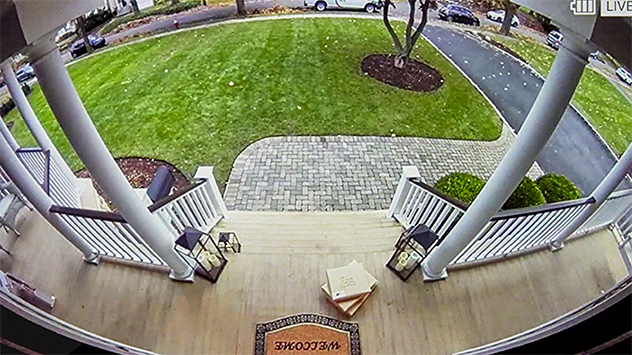 The front-door camera’s 172-degree angle gives you a bird’s eye view of the area. (Hence the name, HomeHawk.) It covers the top of the front door all the way to the bottom, and it captures any activity happening from the left to the right on the porch. HomeHawk’s impressive 172-degree viewing angle ensures you know who’s on your front porch. What’s also nice is the HomeHawk pairs with voice-controlled assistants like Google Home and Amazon Alexa, so you don’t have to deal with complicated settings. Just give simple commands and the device does the rest. Plus, it has room to grow! If two cameras aren’t enough for you or you have lots of areas you want covered, that’s OK — you can sync 14 more cameras for home monitoring. You can purchase Panasonic’s HomeHawk KX-HN7002W model on Amazon.com for $399.95 with free shipping. That includes one front-door HD camera, one peripheral HD camera and a wireless access point base to ensure your home is fully protected. You can enjoy 5 percent off the HomeHawk security system on Amazon throughout August — just use the coupon code 5HHTODAY. Note: Panasonic is a sponsor of Today’s Homeowner, which received this product at no charge to review. Wow, that is perfect….. I work disaster assistance and I would be able to check on my home when I am away. I would feel much better being able to look in my home and see exactly what my neighbor (that collects the mail) is really doing in my home when I am not there. LOL Just a little spy action.